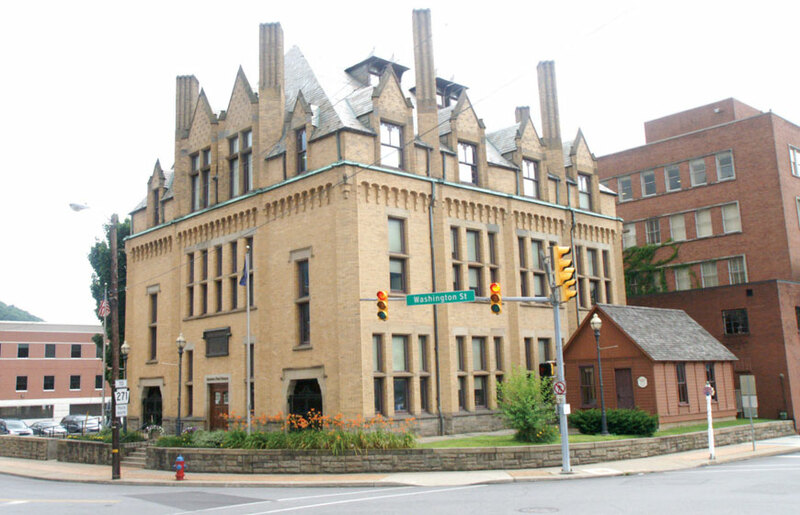 How the Johnstown flood has been memorialized through the years. 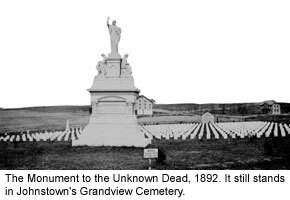 The Johnstown flood is remembered for the scale of the disaster and loss of life. But today, the complex story of the flood provides us with a window on late-19th century America – especially the heedless way the natural world was being developed, and the class tensions that were rising as the United States emerged as a modern industrial society. 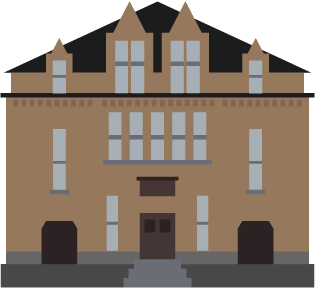 The Johnstown Flood quickly entered into American popular culture, and stayed there for a couple of generations. The Flood engaged the sentimental nature of Victorian society. The sentimental approach was used in early books about the Flood, which were full of horrendous accounts and pathos. The first book on the Flood came out on June 6, and many more were rushed into print. Many of the Flood histories were sold door-to-door across the United States. There was also a rush of popular poetry about the Flood. Photographs of the destruction were sold commercially. 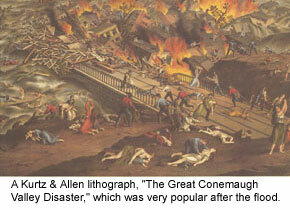 One of the great popular works of art of the age was “The Great Conemaugh Valley Disaster” by Kurtz and Allen of Chicago – a dramatic lithograph showing the fire at the Stone Bridge (as pictured above). 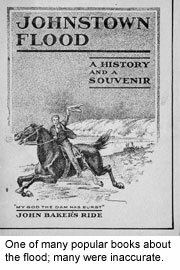 There were many sets of sheet music sold, songs with titles such as “Peerless Rider” and “My Last Message.” Some 20 sets of stereograph cards were also marketed, which allowed purchasers to view three-dimensional images of the Flood’s ruin from the safety of their parlors. Later, mechanical representations of Flood were presented on Coney Island and the Boardwalk at Atlantic City, as well as other sites. In 1926, the Johnstown Flood became the subject of a major Hollywood film starring Janet Gaynor, and 20 years later a Mighty Mouse cartoon treated the disaster. 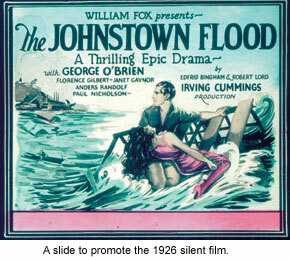 As going to the movies became more popular in the 1920s, cinemas across the nation would show a slide during intermission that read, “Don’t Spit on the Floor — Remember the Johnstown Flood.” Johnstown came to be known as the “Flood City,” somewhat to the dismay of the Johnstown Chamber of Commerce. Johnstown residents did put the Flood behind them; their memorial was to be a bigger and better city. Twenty years after the Flood, Johnstown’s population had doubled and output of its steel mills had quadrupled. No other memorial events were held until the 50th anniversary of the Flood, in 1939, and little more was done until the 75th anniversary, in 1964. Today, the flood is commemorated annually with special events held by the Johnstown Area Heritage Association and the National Park Service. For more about the 1889 flood, visit the 1889 Flood Resources page in the Archives & Research section of this site.